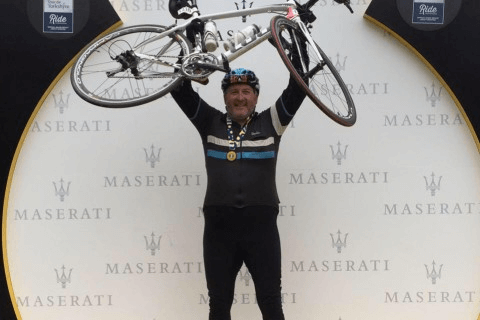 greensplash is very proud to announce that Our Creative Director, Andy, is taking part in the Prudential RideLondon-Surrey 100 to raise money for the fantastic Dog’s Trust! Celebrating the legacy for cycling created by the London 2012 Olympic and Paralympic Games, tens of thousands of people will test their legs and follow a 100-mile route through London and into Surrey’s countryside. Andy is undertaking this grueling challenge in the memory of Sam Spruce; a great friend of greensplash, best friend to office pooch, Zak, and a genuinely lovely man who we sadly lost a few weeks ago. Sam had a great love for dogs and we know he would be delighted that Andy is doing this for such a magnificent cause. “Sam was one of the most generous, easy-going and intelligent people I have ever met – he had a great love of country music. But one thing that stands head and shoulders above anything was his love of the animal kingdom and his hatred of animal cruelty of any kind. He had numerous dogs throughout his life and was a very willing dog-sitter for his furry grandchildren when called upon. This meant that none of our furry kids ever went without unconditional love and endless treats whenever they were with him – even making them a sneaky bacon butty – despite being told not to. One of his wishes was to leave some of the donations from his funeral to the Dogs Trust. So – with myself being a dog lover, a keen cyclist (albeit somewhat out of practice) and myself and Karen already being sponsors of Dogs Trust, I have decided to pick up the training a notch and enter the Prudential London-Surrey 100 and raise some much-needed funds for the Dogs Trust and try and push the donations up to the MAX in honour of Sam and the great work the Dogs Trust do. Good Luck Andy…the greensplash team will be cheering you on and we know you will do Sam proud! If you would like to sponsor Andy click here: https://www.justgiving.com/fundraising/Andy-Dunn12 to view his Just Giving page.